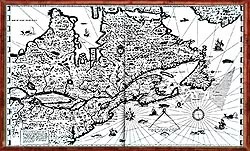 Samuel de Champlain was a French explorer, navigator, and map maker who explored much of Eastern Canada. 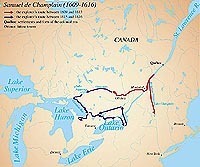 In 1613 while exploring the Ottawa River he needed to bypass the rapids in the river. To do this he portaged through a chain of lakes including Green Lake (now Astrolabe Lake). It is believed that it was here that he left behind his astrolabe. An astrolabe is one of the oldest known navigational instruments used. It served different purposes during its usage: for telling time and determining latitude. To use an astrolabe, it is held vertically from a loop at the top; a weight can be suspended from the ring at the bottom to keep the instrument plumb. When the axis is manually aligned with the horizon and the pointer directed at the sun or north star, the angle of inclination can be read on a graduated disk, then math tables are consulted to determine the latitude. 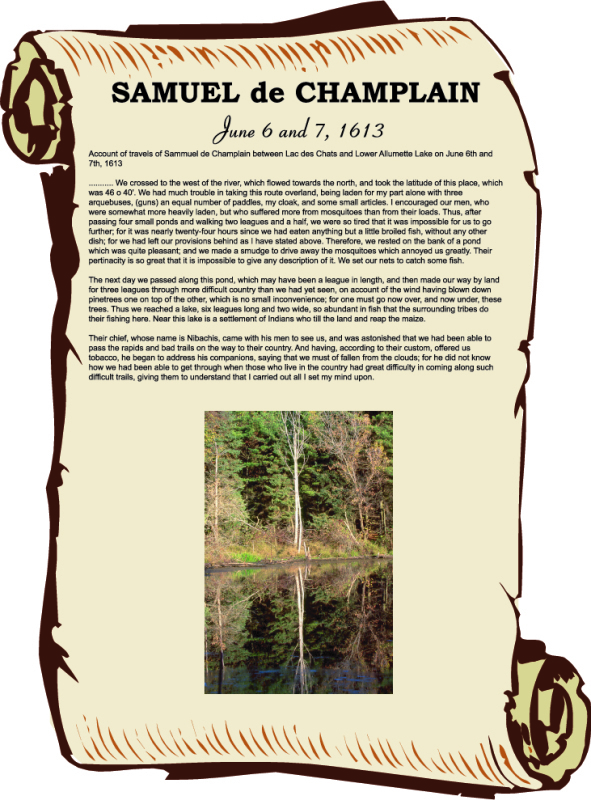 Upon consulting Champlain’s diary, it is observed that the last reading was taken at Green Lake. No readings were recorded after that. It is suggested that during the rough trip through a thick pine growth surrounding the lake, the astrolabe was lost. In 1867, Edward Lee, a 12 year old boy, whose family lived on this property, found the astrolabe while helping his father clear some land by the lake. In 1988, a monument was built at Logos Land Resort, to tell the story of what was lost and where it was found. This was built to honour the memory of the dedicated explorer, an exceptional young man. In the year 1988, a monument was placed on Logos Land's property near Astrolabe lake to commemorate the Astrolabe being found in 1867. 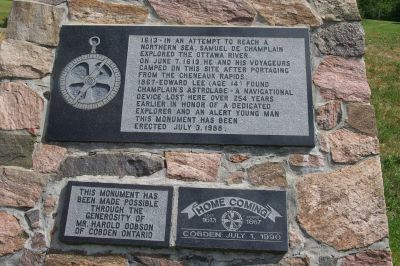 In the year 2000, six 5ft x 8ft information boards were erected along side Buttermilk Creek, on Logos Land property, that give more details of Samuel de Champlain’s life and his journey of bypassing the Ottawa River. Today the astrolabe rests in the Canadian Museum of Civilization in Hull, Quebec.